The idea of a shrine of peace to serve as a memorial of the People Power Revolution came as an inspired thought to His Eminence Jaime Cardinal Sin two days after the dictator fled to exile in Hawaii. The Cardinal was riding in the car together with Bishop Gabriel Reyes, then Auxiliary Bishop of Manila, en route to Camp Aguinaldo where they were to celebrate a Thanksgiving Mass. 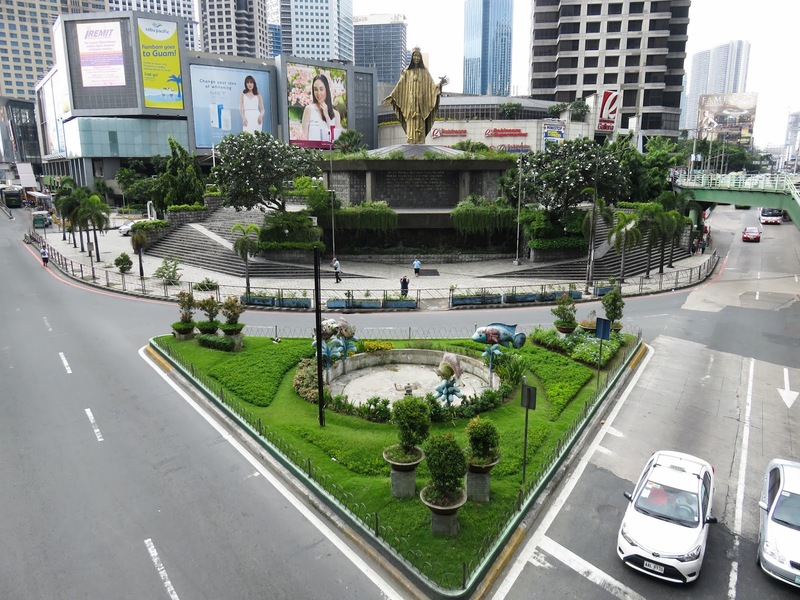 They came upon the intersection of EDSA and Ortigas, and Bishop Reyes pointed it out to the Cardinal as the spot where intrepid but gentle nuns and young men and women stood in front of the tanks and offered flowers to the soldiers. At that corner, on an empty lot had stood two huge billboards of the Family Rosary Crusade, featuring the image of the Blessed Virgin Mary and the slogans, "The family that prays together stays together" and "A world at prayer is a world at peace." The felicitous coincidence could not but evoke the reality of Our Lady's presence at EDSA during the People Power Revolution. Realizing this, the two could not help but recall the story of the "La Naval de Manila" and the Battle of Lepanto, which was fought on October 7, 1751. At this historic battle, Don Juan of Austria, with only a few ships defeated the Muslim Turks, whose ships had outnumbered theirs. Had the Turks won this battle, they could have overrun Europe, making the entire continent Muslim. The miraculous victory of the Christians was attributed to the intercession of the Blessed Mother to whom the people of Rome prayed unceasingly with their rosaries and in processions, asking for help to win the battle. To thank the Lord for the victory, Pope St. Pius V in 1572 instituted the feast of Our Lady of Victory. A year later, Pope Gregory X changed the name to the feast of Our Lady of the Rosary. The Feast of La Naval de Manila was also instituted in thanksgiving to the Lord for another naval victory. During the Spanish times, the Protestant Dutch tried to conquer Manila. However, the Spanish fleet manned by Spaniards and Filipinos roundly defeated the far-superior naval force of the Dutch. This naval victory was attributed to our Blessed Mother of the Most Holy Rosary because as the naval battle was raging, the people of Manila continually prayed the rosary. This is the origin of the Feast of La Naval de Manila, which is celebrated (in a very special way in the Sto. Domingo Parish in Quezon City) on the first Sunday of October. The EDSA Revolution was more miraculous than the Battle of Lepanto or the "La Naval de Manila." Thus did the idea of a memorial structure to thank the Lord and the Blessed Mother for the peaceful EDSA Revolution come to mind. Cardinal Sin then set into motion a series of steps to turn his idea into reality. The owners of the land, the Ortigas and Gokongwei families, were approached and they donated the prime corner lot. The architectural and structural design for the church was undertaken by Architect Francisco Mañosa with preparatory work from National Artist Architect Leandro Locsin and Architect William Coscolluela. Architect Mañosa designed the Shrine to evoke the freedom of movement and celebratory spirit of the original EDSA Revolution. The Shrine is to open out to the streets with the image of Our Lady of Queen of Peace, as sculpted in bronze by the late artist Virginia Ty-Navarro, forming the apex of the structure. The promenade is accessible through cascading stairs and ramps from EDSA and Ortigas Avenue. The center of this plaza faces the convergence of the two main roads and has become the site of the Eucharistic celebration held each year to commemorate the People Power Revolution. Various works of art symbolize the spirit of freedom and peace at the Shrine's promenade area. At one end is the "Flame of Freedom," a sculpture done by artist Manny Casal of three hardy men bearing a cauldron of flame over their shoulders, representing the Philippines' three major islands, Luzon, Visayas and Mindanao. Throughout the plaza are the 14 Stations of the Cross as rendered in bronze by national artist Napoleon Abueva. At one corner are the carillon bells, which were crafted by some friends from Holland from the bullets and cannons of the Second World War. At given intervals during the day, the bells chime familiar patriotic and religious tunes, mostly evoking sentiments of the People Power Revolution. The main chapel spans the breadth of the entire intersection and is accessible from either avenue. At each side are chapels, one the San Lorenzo Ruiz chapel and the other the Chapel of Perpetual Adoration. Natural lighting is obtained from all sides, except the main altar wall, which draws light from the skylight above. This skylight is diffused by a stained glass ceiling designed by artist Eduardo Castrillo. Within the main chapel, a floating glass sculpture of the Risen Christ by Ramon Orlina overlooks the main marble altar also created by Abueva. The upper walls are muted murals that depict and interpret the four-day revolution by 15 artists from Angono, Rizal, led by Nemi Miranda. The art works "Doves of Peace," also by Casal, rest gently on the holy water fonts by the entrances. At the chapel of the perpetual adoration the Blessed Sacrament is dramatically exposed through the monstrance-sculpture done by Castrillo. At the other side chapel named after the first Filipino saint, San Lorenzo Ruiz, there is a wall mural depicting the saint's life painted by artist Ben Alano. These works by Filipino artists – architects, sculptors and painters – form a unique collection that pays tribute to the indomitable spirit of the Filipino people. These works inspire, elevate, comfort and cheer, and in their unifying purpose, bring the people who visit, pray and celebrate in the Shrine closer to God, the source of peace. In time, the other rooms in the Shrine gave way to the needs of the people. Thus at the Ortigas side, a small room was built called Silid Leonarda, named after one of the Shrine's dedicated early community members, a Papal awardee, fondly called Tita Leony (Leonarda Torres) who died in 1996. Another room, Silid Assisi, was built at the EDSA side of the Shrine. In 1998, soon after the celebration of the anniversary of the EDSA Revolution in February, construction for the Serviam Hall on a portion of the promenade began. Within three weeks, the hall, named after the motto of Jaime L. Cardinal Sin which means "I serve," was inaugurated. The hall has fittingly become the venue of the Shrine's formation activities (Fullness of Life seminars, catechism for the sacraments of confirmation and matrimony, spiritual nourishment recollections of the Shrine's various groups.) Once again, Architect Mañosa designed the hall to blend with the original architecture of the Shrine, unobtrusive from afar because of its glass walls. The construction of the original Shrine was almost complete by late November of 1989 and preparations were underway to have it inaugurated on December 8, 1989, the Solemnity of the Immaculate Conception. But once again the country was rocked by threats to its democracy. An attempted coup d'etat broke out on November 29, 1989. The inauguration had to be postponed as the government thwarted the rebellion of a military reformist group. At the height of the uprising, some of the military rebels entered the Shrine, but did not do any damage to the unfinished structure. His Eminence did not postpone the set inauguration certain that, with prayers to the Blessed Mother, the Shrine would be completed by December 8. The putschists finally surrendered on December 7. Amid the somber aftermath of the failed coup, but with quiet rejoicing among the faithful, the Shrine of Mary Queen of Peace (Our Lady of EDSA) Shrine was formally consecrated to God and dedicated to the Blessed Mother on December 15, 1989.